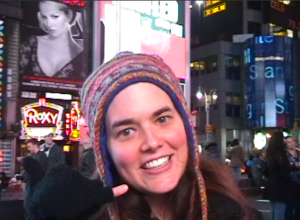 Today’s tip is my first shot “in the wild” — on the streets of Times Square, NYC!! Super special thanks to my camerawoman and amazing friend, Missy Mazzoli, who made this episode possible. A little while back, I was working with a student who got stuck on a math problem. “Can I call my brain on the phone?” she asked. “Sure,” I said. I didn’t know where this was going, but I wanted to see what my student meant. Why? It’s so silly. It’s a little crazy. Why does it work? 1. You’re talking out loud. Researchers in Spain found that students who talk through a problem out loud have a greater chance of solving the problem correctly. I’ve often wondered if part of the reason tutoring works so well is just because it forces students to talk through what they’re doing. Paradoxically, we are frequently conditioned in school to think that when we’re working on math by ourselves, it needs to be a silent solitary activity, but talking through a problem out loud can really get the math juices flowing. 2. It’s totally proactive. Instead of letting your eyes glaze over, moving on to the next problem, saying “I hate this and I’ll never get it,” or giving up completely, my student took an active approach. 3. You’re trusting yourself and relying on yourself. Even though my student was characterizing her brain as something “else,” she was really trusting herself, trusting that she had some untapped inner resources she could access if she came at the problem from a different angle. 4. You’re being yourself. When you’re really yourself when you’re doing math, you plug into all kinds of resources that you would cut yourself off from if you believe you have to behave a certain way or be a certain kind of person in order to succeed at math. 5. It’s a little bit silly. In my experience, being a little silly — doing something crazy like “calling your brain on the phone” or doing math in a silly voice — not only keeps things fun but also prevents students from shutting down or going into panic mode. And like talking things through out loud, it seems to open up more possibilities. I’m proud to report that my student has used this same technique several times since she first introduced it to me, with great success. So today’s tip is, when you’re stuck on a math problem, talk it out!!! Whether that means calling your brain on the phone, just talking it through out loud in a silly voice — or in a normal voice. Have you ever called your brain on the phone? Is there a special (possibly silly) technique you like to use when you’re stuck? Leave a comment because I’d love to hear all about it! Is multi-sensory learning hardwired into our humanity? Great post! I love your student’s idea of calling up her brain on the phone…it will help me remember to try talking out a problem in the future. Thank you, Nichole!! I’m so happy to “see” you here! Love to you!